Gung Hay Fat Choy, everyone. 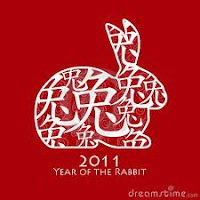 “Best wishes, congratulations, and have a prosperous and good year.” According to the Chinese calendar, Thursday ushered in the Year of the Rabbit, which will last until January 22, 2012. If you missed it, don’t worry. The celebration lasts for 15 days, from the new moon to the full moon, so you still have time to join in, if you’re so inclined. I spent some time browsing around a few of the websites predicting what we might expect from this year. Many mention that things will be more relaxed after last year’s ferocious Year of the Tiger. Congeniality, diplomacy, negotiation, a chance to calm our collective nerves. More focus on home and family. A temperate year with an unhurried pace. Sigh. That all sounds pretty good to me. But as far as my writing is concerned, the kick-back-and-relax mentality is not my best choice. I certainly don’t want to reach the "point of somnolence,” as one site cautioned. But Rabbits are also seen as creative, persistent, flexible, prolific (though in a different way), and shrewd, qualities I wouldn’t mind putting into action this year. I’ve thought that Chinese horoscopes are interesting and fun ever since reading my first paper placemat as a kid, but like all horoscopes, I take them with a grain of salt—or a dash of soy sauce. I enjoy imagining that the forces of the universe might be pulling for me from time to time, especially in the writing business. But the best advice never changes: work hard, keep learning, and don’t give up. What do you hope the Year of the Rabbit has in store for you and your writing? I'm hoping the Year of the Rabbit will be better for me than the Year of the Tiger was. I need to stay centered and focused...not pacing like a tiger in a cage. I agree, Luana...the pacing tiger isn't too productive. Good luck with your focus.